Make-your-own-wine stores have always had a dodgy reputation: The strip-mall locations, the invariably cheesy names (D-I-Wine, Wine Not? ), the el cheapo ingredients. You’ve probably been at a get-together where the host proudly whips out his crookedly labelled bottle of aftershave-spiked fruit punch. Vintage One, which opened in Etobicoke last month, aims to make amateur wine making respectable – and drinkable. The difference is clear as soon as you descend the stairs to the basement storefront: Deep red walls enclose a moodily lit cellar space where brother-and-sister team Alejandra and Jeronimo De Miguel greet clients. (The pair are working with Julian Pinder, who, along with Alejandra, also owns the Little Italy microwinery and restaurant, Olivia’s at 53.) There’s a sitting area for consultations, complete with copies of Wine Spectator and complimentary espresso. That means that Vintage One clients, if they want, can be heavily involved in all stages of the process, choosing a varietal, crushing the grapes, monitoring the fermentation process, barrel-aging and bottling. For the De Miguels, whose parents were vintners for the Trapiche winery in Argentina, it’s all about quality; in contrast with wine-kit stores that use grape juice concentrate, Vintage One sources actual grapes, even offering French or Hungarian barrels for the aging. 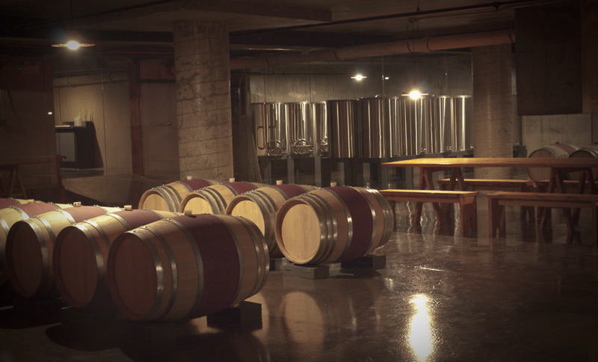 Vintage One Urban Winery, 4896 Dundas St. W., 416-231-6994. Wines, from $120 to $2,600 for a batch of 26 bottles. Image of Vintage One courtesy of Julian Pinder. I have recently had the “pleasure” of purchasing a groupon for one of their wine making experiences. It has been by far the WORST experience I have ever had!! They were absolutely disorganized and rude. From the very start they have done nothing as they promised, except for take my money ofcourse. I had to practically beg them to let me get my bottles before Christmas (as the bottles were meant to be presents and I was promised that beginning of October they would contact me) and were ordered in July! After 5 phone calls and a lengthy email I finally got an appointment mid December to come and get my bottles. When I arrived I was told no such appointment was booked for me (even though I have email confirmation stating that my appointment is confirmed) and the owner tried to blame her mistake on me saying that it was not confirmed. Im sorry, but when she emailed me personally confirming the time and date it’s hard to imagine that it is not a confirmation. Was I meant to go there myself and personally type the appointment in their computer? The receptionist tried to explain that in that 2 week frame of me making the appointment and the actual event they had an electrical problem and many clients had to be pushed aside. Thanks for lying to me and making me drive all the way to your place to tell me that im not in the system and not important enough in the first place even if I was. Guess the fact that Im not spending thousands on their wine is what’s important to them. Forget the little people. Who runs a business like that? To add insult to injury, the labels I mailed in September to be put on the bottles seemed to be lost and the receptionist asked me to re-send them again. Fine, another appointment was made. The next time I had to send my boyfriend to pick up my order as I had a previous engagement. Well, they charged him for the service again (I pre-paid for everything in July) and gave him red wine when I originally ordered white! This has been the most unprofessional service I have ever experienced. Save yourself the hedaches and go elsewhere!!! !